Winning Patterns on the trainers that dominate this popular meet! Bonus Handicapping Articles. Detailed write-ups on the 24 trainers, explaining exactly how they win at this prestigious meet. How do they win? What patterns do they use? Keeneland Winning Trainer Pattern no longer includes boring stats on a bunch of trainers. 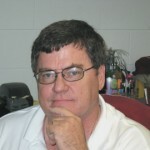 Instead, author Art Parker has taken a hard look into his comprehensive personal database at the trainers that win the majority of races at the meet – the 24 so-called Kings of Keeneland. The 2016 Spring Meet Edition of “Keeneland Winning Trainers” is published by All Star Press. You can put this comprehensive trainer guide on any PC or Mobile Device, and then easily look up the Kings of Keeneland when you are ready to handicap or play a race! $12.97 for the complete 27-page, jam packed book. Keeneland offers a short condition book that is jam-packed with great racing. As mentioned, the racing cards cater to the high profile barns that ship in from out of state, so the condition book and daily cards reflect this. There is a stakes race nearly every day, and always part of the popular late Pick-4 wager. Several horses will prep at Keeneland for the upcoming Breeders’ Cup at Santa Anita at the end of the month. Always be on the lookout for runners from top turf barns such as Glen Hills Farm and Augustin Stables. It’s surprising how often they will score at a price. Parker’s digital book covers all the horsemen who have won races over the past nine Keeneland meets, and most importantly, how they did. Were the winners making class changes? Surface changes? What kind of work pattern did they have coming into the race? What jockey did they use and who were the owners? Parker details just how these horses were prepared by their winning trainer, providing players invaluable insight into the methods of these successful horsemen. With Parker’s book, for example, you’ll learn not only how often trainer Tom Amoss wins with layoff horses (an amazing 10 of his 22 winners), but also the other angles that go along with those winning runners. Or how about local trainer Rick Hiles, whose three winners all sported the same handicapping pattern and won at odds of 9/2, 21-1, and 39-1, respectively. If a trainer has won at Keeneland, you’ll gain insight into how they did it. As you can see, it’s a great guide for players that like to dive into the raw data. Exploiting the Keeneland track biases used to be one of the many reasons that professional players salivated at the thought of opening day. The old dirt oval could be one of the most biased courses in the country and ‘being tuned into it’ proved to be very lucrative. Many handicappers believe that went out the window when management switched to Polytrack. That is not entirely true. The Keeneland Polytrack would oftentimes be very biased, especially when weather changed in the Bluegrass state. Now we’re back to dirt and it will behoove the horseplayer to pay close attention to how the new main track plays on the first couple days of racing, especially the first couple of races each afternoon. One factor you can almost always rely on involves two-turn races on the dirt, specifically the 1 1/16-mile events. The starting gate for this commonly run distance is close to the first turn and the stretch run is short, ending at the first finish line, making it conducive to horses with tactical speed breaking from inside posts. I expect this long-term trend to remain with the new track in place. If there is a wager you like, Keeneland pretty much has it. With rolling Pick-3s, dime Superfectas, and early and late Pick-4 wagers with guaranteed pools, Keeneland offers a comprehensive wagering menu. It’s a far cry from one of the first times I visited the track in the late 1980s. In one race I liked two horses ridden by Pat Day and Randy Romero, respectively, and both were juicy odds of 8-1. Needless to say, this was a rare occurrence at this track for either rider. There was no exacta in the race, and I had to sit there in frustration as the future Hall of Fame riders ran one-two. Keeneland offer the best of everything, from low takeouts to just overall great racing. If you are fortunate enough to attend this track in person, you’ll likely enjoy a wonderful day of horse racing. Spending an afternoon in Lexington, attending live racing, can remind us why we fell in love with this sport in the first place. Good luck! The 2013 Spring Meet Edition of “Keeneland Winning Trainer Patterns” is now available from publisher All Star Press. We’ve put trainers, Keeneland, and the past six meetings together (3 years) to try and have the best results possible for the upcoming spring meet, 2013. Our focus is on the trainers that do more than show up and win a race. We have detailed the individuals from the last six meetings that were multiple winning trainers. In other words, a trainer had to collect at least two victories to be recognized. Just how good were the multiple winning trainers? Here are a few facts that validate the importance of these successful trainers. Keeneland held 912 thoroughbred races collectively in the Spring and Fall meetings of 2010, the Spring and Fall meetings of 2011, and the Spring and Fall meetings of 2012. Trainers winning at least 2 races totaled 103. The 103 multiple winners won a total of 817 races collectively or 89.5% of all races. Of the 103 multiple winners, 47 trainers won at least 5 races. Those 47 trainers collected a total of 625 wins or 68.5% of all races. 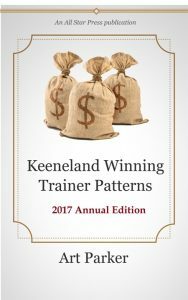 The details of all 103 trainers and their corresponding victories over the past 6 seasons at Keeneland are presented to handicappers in this book, Keeneland Winning Trainer Patterns. A one-of-a-kind publication. Only $9.97. Instant download now through PayPal. Put it on any PC or Mobile Device! 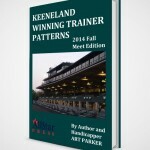 2012 Fall Meet Edition of “Keeneland Winning Trainer Patterns” now available! Understanding the tendencies of trainers is one vital key to success for winning horseplayers. 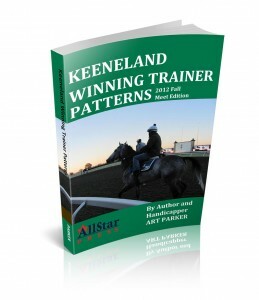 All Star Press is pleased to announce the 3rd edition of the Keeneland Winning Trainer Patterns – new for the 2012 Fall Meet. Again, this meet’s release is bigger and better than ever with great nuggets on all the winning trainers. 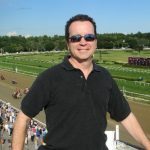 This valuable handicapping guide is based on the extensive database of handicapper and author Art Parker, a regular contributor to AGameofSkill.com. In this book Parker analyzes the winning patterns of the most successful horsemen that race at Keeneland. With this guide you will know how each and every trainer prepares his runner for success. Keeneland Winning Trainer Patterns covers every Keeneland horsemen that has saddled two or more winners over the past five meets, dating back to the spring of 2010. The details of all 96 trainers and their corresponding victories over the past five seasons at Keeneland are presented to handicappers in this book. How many works does this trainer’s winners have coming into the race? What kind of works are they? Where do they ship in from? How quickly do they race back? Were class changes (up or down) used? How about surface or distance switches? “Most importantly with Keeneland Winning Trainer Patterns you will know if the horse this trainer is running today fits a pattern similar to winners in the past. This knowledge is one of the absolute best ways to get an edge over the public when playing Keeneland.” — Rich Nilsen, 10-time NHC qualifier. Of course, you’ll also learn who rode these winners and for what stable this trainer wins for. Patterns develop and that is how the horseplayer can cash at the upcoming Keeneland meet. Alphabetical and Numerical list of every winning trainer over the past 5 meets. 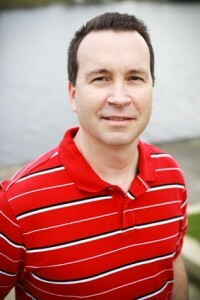 Special Trainer analysis by Rich Nilsen. Profiting at Keeneland is all about knowing the tendencies of the individuals that know how to win year-in and year-out at the Lexington racetrack. Kindle users – download this handicapping guide to your Kindle eReader or Kindle reading app today! Keeneland Winning Trainer Patterns – 2012 Fall Meet edition is available in ALL E-BOOK FORMATS, so click here if you want a format other than PDF or Kindle.